Gulf Bridge International (GBI), a service provider that operates an integrated network connecting the world to the Middle East, has signed an agreement with Ciena to upgrade its submarine and terrestrial networks. GBI will deploy Ciena's 6500 packet-optical platform to enhance network flexibility and scalability, boosting capacity through the use of 100G and 200G coherent wavelengths. Vodafone is investigating the potential of using advanced access network technology over its existing infrastructure by carrying out a field trial of time and wavelength-division multiplexed passive optical network (TWDM-PON) technology in partnership with Alcatel-Lucent. The pair have been collaborating on TWDM-PON development since 2010. When Alcatel-Lucent introduced its TWDM-PON system at Broadband World Forum last October, the vendor said it had been developed together with Vodafone. The European Commission is supporting construction of a new submarine fibre-optic cable between Europe and Latin America, linking Lisbon in Portugal with Fortaleza in Brazil. Today Latin America relies on undersea cables going to the US to carry nearly 90 per cent of its communications traffic to Europe. The one existing cable that directly connects Latin America and Europe is outdated and only used for voice transmission. Xtera Communications has deployed its next-generation Raman repeater into the High capacity, Undersea Guernsey Optical-fibre (HUGO) subsea cable system connecting the island of Guernsey with the UK and France. HUGO is partly owned by Sure, supplier of telecommunication services in Guernsey, Jersey and the Isle of Man. This project represents the first deployment of Xtera’s repeater in a commercial system, as well as the industry’s first deployment of a Raman-based submarine repeater, the company claims. Stadsnätsföreningen, the Swedish Urban Network Association, has chosen TransPacket to provide cost-efficient ‘virtual wavelength’ services to its customers throughout Sweden. Using TransPacket´s hardware, Stadsnätsföreningen will be able to provide cost-efficient, flexible service provisioning and efficient bandwidth utilisation. Ciena has notched up another customer win for its 6500 packet-optical platform: O2, the commercial brand of Telefónica UK Limited, which plans to build a new high-speed nationwide network throughout the United Kingdom. 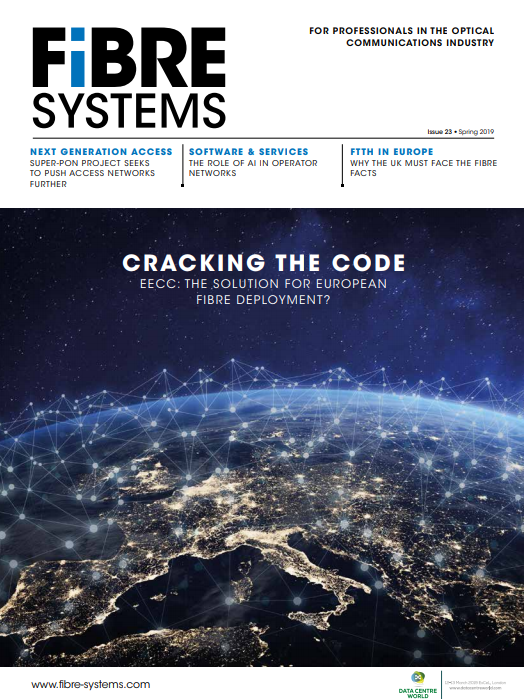 This new backbone network will connect major UK cities, including London, Manchester, Edinburgh and Liverpool, and enable O2 to deliver web-scale services to support massive growth in data centre and network virtualisation demands. Alcatel-Lucent and Energia Communications have joined forces to conduct the first field trial in Japan of next-generation ultra-broadband access technologies that will pave the way for the delivery of higher capacity business and residential services, including ultra-high definition 8K television and video-on-demand. Cable group Liberty Global has turned to Transmode, a supplier of packet-optical networking hardware, for 100G metro deployments across Europe to support increased network traffic. The international cable company, which has operations in 12 countries in Europe, will be using Transmode's TM-Series platform to upgrade its metro and regional networks to 100G. The roll out has already begun in “several countries” according to the vendor.